As we continue to fight for the issues that matter to you in Trenton, we need your support to be successful. As we build support for our issues, we must make sure that our allies are supported and that we show them that we are speaking with the backing of thousands of small businesses. We ask that you please make a donation to the NJGCA Political Action Committee. 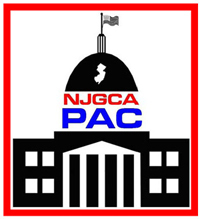 It is incredibly important that NJGCA has a voice and an influence in the coming election in order to ensure that your interests are represented in Trenton. Your donation will allow our association, and that means you and your business, to be a leading power player in Trenton. Money is what gives us our foot in the door, makes us new friends, makes old friends stronger, and makes potential enemies think twice about trying to go after your business. It is what we use to ensure that our allies remain our allies and remain in places where they can help us. It also allows us to make new friends. Most importantly, your donation makes potential enemies think twice about trying to go after your business. The greatest strength that comes from your contribution is the knowledge that there is an authentic New Jersey small business standing behind it. Donating to the NJGCA PAC is one of the most effective ways you can help fight for the issues that matter to you and your business! We recommend a contribution of $100, but any size will be effective. To donate to the NJGCA PAC, please fill out our contribution form by clicking here.